Papercrafts by Patti: Big Congratulations, Graduate! Today's card is my last graduation card of the season. I began by finding inspiration from Jo Anne Hewins. I didn't have the same sentiment, so the "congratulations" part is my own. Black, White and Sparkles look pretty festive and cutting out all of the elements was easy using my Big Shot, Dies and a punch. I popped up the balloons, numbers and banner over the spectacular Softly Falling background. Thank you for stopping by today! I hope you will take a moment to leave a comment for me. 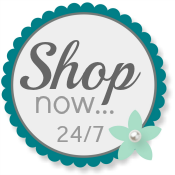 When you are ready to shop, please use my Online Store.